EAP Warning: This post is based on ReSharper 6.1 Early Access Program and some things such as screenshots and minor details might vary from the time this has been written to the time of release. In a previous post on ReSharper 6.1 Settings, we introduced the concept of layers and covered a few scenarios when it comes to sharing of settings across solutions. In this post we’re going to cover a few more, namely: syncing settings over DropBox and providing a global setting for all projects across a company. As developers we often end up working on multiple machines, whether it is that we own a desktop and laptop, or two desktops, one at work and one at home, or any other combination of scenarios, we have the need to alternate between machines. With the new layers settings in ReSharper 6.1, sharing the same settings in these cases has now become quite easy. The idea is simple: add a new Global Layer and host the file in a DropBox folder (I’m using DropBox, but obviously you can use any other mechanism that syncs files remotely). In order to do this, we first need to export the current settings to that new file and then mount it. 3. Select Add Layer | Existing File and select the file created in the previous step. We now have to repeat step 3 for each of our machines. Once we do that, the settings will automatically be loaded every time DropBox syncs. It should be pretty apparent that providing company-wide settings across all projects is pretty much the same as sharing via DropBox. We just need to provide a file. If we want to provide solution company-wide settings, we’d add the layer to the solution group. This would allow an alternative way of sharing settings which wouldn’t require the file to be checked in to source control. Settings can be imported, exported, activated and deactivated (marking the checkbox or unchecking) at any point. We can also Copy To button to copy settings from one layer to another layer, making it also easy for sharing. In essence you can do pretty much anything you like now. You might be thinking, if I could setup my settings to read from a specific file, why would I want more layers or the ability to order them in priority?. The idea with layers is that each one can add one or more configuration settings. This means that for instance a company could have a layer where only code formatting settings are defined, another layer where templates are defined and so on and so forth. When we export settings to a file as shown in two, we define which settings we want exported. We do not have to select them all like we did previously. We could for instance only choose to export Templates, and mount a layer where only these are defined. ReSharper can understand that there are different options in different layers and provides us access to them all. We don’t have to worry about this. The only thing we might need to take into account is if one layer overrides another one’s settings. That’s where the Move Up / Move Down comes in, allowing us to specify the priority. The layers provide a lot of flexibility when it comes to sharing settings, either between two machines, a team or company-wide. Use them, abuse them. Give us your feedback. 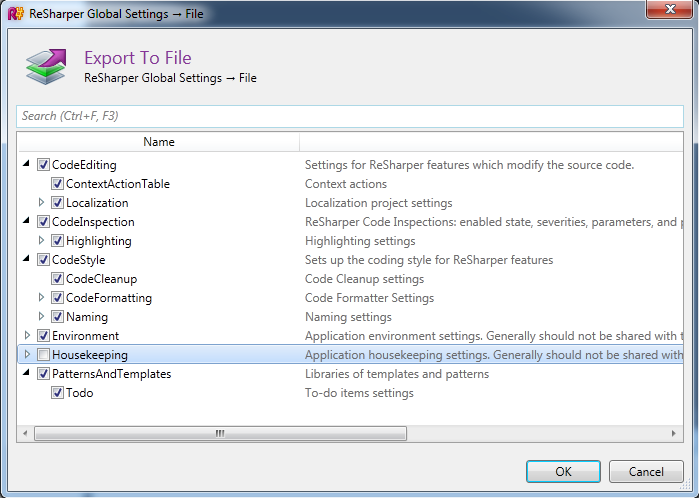 This entry was posted in How-To's and tagged ReSharper, ReSharper 6, settings. Bookmark the permalink. We do the same but using a common SVN repository that all update daily, so the settings are shared and with change logs. We’re looking into that issue, thanks! Is very cool to participate reporting issues and suggestions and be hear like in jetbrains. Resharper 6.1 rocks. Keep in the good work guys !! I really want to use 6.1 again. Hoping so. It’s marked as show-stopper. @Justin RSRP-280076 has been fixed. Try it now. Proper fix will be delivered in 7.0 I think. OK great, I’ll try the next nightly build. It’s great to see the company-wide settings. I’m still wondering if something between Solution-level and company-wide can be achieved. We have settings that apply at the enlistment root, across many solutions. But if someone is working on another enlistment in a different project these should not apply. It would be great if having a “x.DotSettings” in the folder hierarchy above the solution automatically creates a layer that is above the solution (just like StyleCop goes up the hierarchy to inherit settings). This avoids having to manually add/remove the “company-wide” settings each time you work on one enlistment vs another. Is this possible given what you have so far in 6.1, or would that be a seperate feature? That should be possible. When you create a solution level setting, it will take effect over the global one. Can we safely delete “*.6.1.ReSharper” and “*.6.1.ReSharper.user” files? At least the latter one seems to be still updated if it exists — but both files don’t get created on new solutions. Andy: You first have to click on an existing (locked) entry in order to specify the group to which the layer should be added. Just realized – it is a bad idea to copy search and replace patterns between layers. They highlighting the issues multiple times. And from context menu it is not possible to know where it is placed or which one you currently editing. If I want to apply settings to both, I’d like be able to place a *.DotSettings file in either /Root or even the directory above it, and have it apply to both solutions. Is this possible? Can it be hooked automatically like StyleCop detects it (without requiring each developer to manually hook in a layer for each Workspace)? Thanks! Btw, why there is no “Fixes” links in last EAP builds 24, 25? Nothing fixed? in 6.1 that won’t be supported but it’s something we’re discussing and looking in to. Any chance you can work with them to get this feature into 6.1? Does the ReSharper automatically check out the settings file(s) from the source control, or should it do the developer itself? +1 for Tim’s request. That is exactly what we need as well. Dozens of solutions, all of which need to share settings with other solutions in the same “enlistment” at a common root folder. The StyleCop feature that does this is great since your able to check the settings file into version control and it just walks up the tree until it finds it. With developers pulling down different branches to arbitrary locations all the time, managing the R# settings by hand is impossible with so many different branches in flight at once. Solution-level settings are of no use, since solution files are generated as needed (and since any VS feature that is solution-specific is just a big mess). This approach still requires each of the developers to go and “Add a Layer” under the Global Settings or Team Shared Settings. How would I do that without such a manual effort for every new environment/machine/developer that is set up? For example, sharing solution level settings across the developers is possible, by adding .sln.DotSettings to the source control. How do I achieve this for multiple solutions? I got the answer to my previous post! When we add a layer to the “team shared” settings, the layer information is stored in the .DotSettings file as well, with a relative path. 1. Create a global .DotSettings file that sits in a common folder in source control. From now on, do any options modifications only in the global layer under the team-shared settings. Other developers need to get the latest version of the global settings file, if they want to see the latest changes. This requires just a one-time setup whenever a new solution is created. We can live with this solution, till a much simpler solution as mentioned by @Tim, @Brian is implemented. @orangy: You mentioned that it is possible to add layers programmatically with a plugin. Could you point at some documentation to help us get started? Or maybe explain what parts of the plugin api we should be looking at? There’s no step-by-step as such but it is something we’re working on. To get you up and running you’d need to download the SDK first. There are templates and samples for working with ReSharper API and if you have any questions, ask away on our SDK forum. I need to apply a common setting to all developers over all projects in our organization. From what I’ve gathered here, I am supposed to achieve this by adding a new layer under the “Global Settings Group”. I could not find this group, but i assume this has just been changed to now being named “This computer” in the 6.1.1 EAP..? Still, there seems to be an error in how settings files are prioritized (or applied) as even though i create a layer under Global (or “This computer”) it will be applied _before_ the global, local settings-file found under: %AppData%JetBrainsReSharpervAnyGlobalSettingsStorage.DotSettings. This effectively results in that no matter what the company-wide settings file states, any settings present on the developers system will still by applied _over_ the company-wide settings I am trying to “enforce”, if they, at any point, have saved their settings by pressing “Save”. Shouldn’t the local users settings be applied _before_ the layer i added so that the company wide settings take effect? Alternatively one could have a default layer already present under “This computer” representing the users default settings, so that another global layer settings file can be added and placed in order of application. How do you suggest solving this? Sorry for the delay. Somehow missed this. As I mentioned earlier, we do not enforce people overriding policies. As such if someone does override a certain setting they shouldn’t it will take preference. But this also has a positive side which is, things that are not company policy can be adjusted to each developer’s needs. The issue of the saving modifying something the user is not aware of is somewhat of a problem and we’re hoping to address that in the next versions. the resharper settings manager for 5.1. was all about enforcing settings. This was excatly what we needed. Now with the new 6.1. every developer can override anything he wants. That is not sharing settings, it can just result in pure chaos. I simply can not see why this very often asked for feature is not implemented. The logic is so simple: take this settings file in this path where all settings available are saved (not just changed ones) and voila. 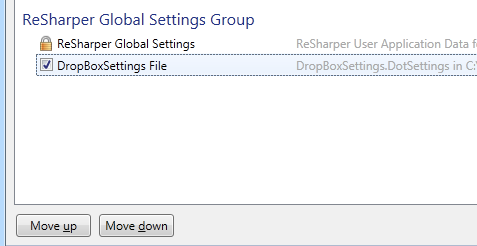 I do not see a Resharper Global Settings Group. Is it the This Computer group instead? Is it possible to add a layers in Mange Option using Resharper SDk through C# macro or add ins ? Yes it is. Shoot me an email (hadi at jetbrains) and I’ll guide you on the classes you need to work with. I have sent u a mail on this at hadi@jetbrains.com. I have to agree with Michael Fagré, I think the prioritisation is the wrong way around, and that you should apply the personal developers rules first and then the global rules afterwards, so that any rules which are not specified in the global rules inherit from the personal developers ruleset. Otherwise we’ll need be able to enforce company wide settings as this blog suggests we can, it’s simply not the case at present. To extend, developers who only want their personal rules can simply not have a global layer, and if they are within a company that enforce settings then they shouldn’t be able to override them in the first place, that seems like madness. Sorry I might be misunderstanding. What you’re describing is how it works and the opposite of what Michael is asking for. But the second comment indicates that you do want them enforced?